It has been an interesting week at school. We continue to do still life drawing day after day. It can get a tiny bit tiresome. I am always glad for Fridays, not because they are the end of the week, but because we get to draw gesture sketches from a live model and it isn't a still life! 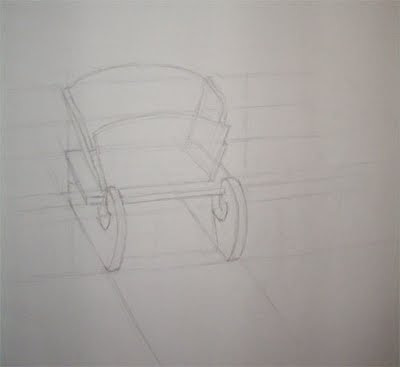 Friday afternoons we draw a single object and add the construction drawing, but I am getting ahead of myself. I know, as usual, hard to see as they are in pencil and deliberately drawn lightly but there is a shoe in the foreground that was rather fun to draw. The two sticks are actually paint brushes greatly simplified. It took me a bit of adjusting of my scale and proportions but I am fairly satisfied with the shape of the vase which had a wonderful round fullness to it. This was challenging because the birdhouse was so much smaller than the toy chair. You really had to turn your mind off, that is the left side, to just draw what you see. 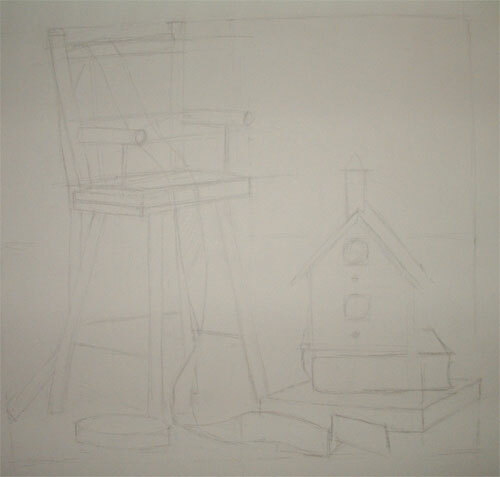 We draw two still life drawings in a school day, each three hours long. 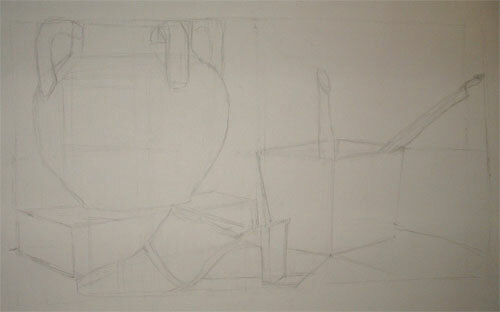 And, when I go to the evening class, another three hour still life is drawn. I did go to Tuesday's evening class and skipped Thursday because it was cold with snow and rain mixed, I was tired, I needed a bit of down time to digest some rather deep learning experiences, and I really just wanted a cozy evening with my guy and dog. None of those are good states to be in when concentrating on a drawing and when they hit all at once, it is time to retire for the evening. A simple little red sleigh. I should explain a bit here. With a construction drawing we start out drawing the object visually, which is how we usually draw still life. 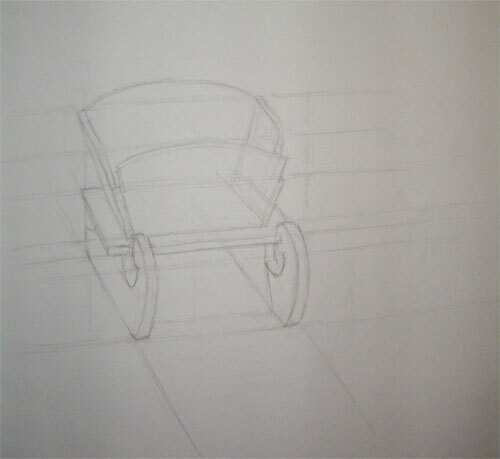 After we get it as close as we can visually, we add the perspective in to correct angles and lines. The corrections are usually very small, sometimes a line-width or up to 1/8th of an inch. Anything more and you know you need to correct it a bit more visually before moving onto construction. That is a lot of drawing!! But I'm sure that's also what it takes to get really good at it!! I so admire your dedication. Keep up the good work! You are moving right along. I love the little sled sketch. I can see where you started and how you got to there...While all are interesting it's nice to see the process. Hope you enjoyed the coffee shop, any of them They are all pretty good and have their own individual ambiance!